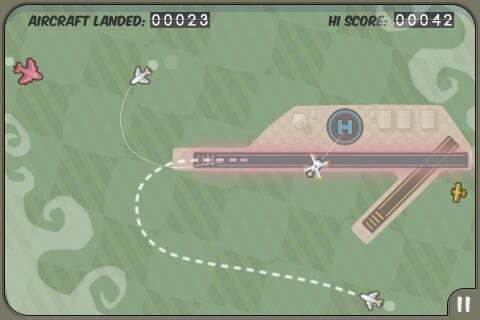 Last week, gaming developer Firemint released their newest iPhone game into the App Store called Flight Control [App Store]. Yes, the same Firemint that has been hard at work on the impressive Real Racing iPhone game due later this year. For their first self-published release, however, they focused on a simpler time management game which involves routing incoming airplanes to their proper landing strips. While the game seems incredibly simple on the surface, the company has managed to hit upon the winning balance of easy pick-up gameplay, ramping difficulty and tickling the need to try “just one more time". Flight Control presents you with a single map with two runways and one helipad. Airplanes and helicopters fly onto the screen and your job is to simply direct each plane to their respective landing pads (designated by color) while avoiding mid-air collisions. Airspeeds vary by aircraft type. The large red airplanes travel the fastest which can cause some timing issues when coordinating landings with the small red airplanes. The intuitive controls of the game, however, are what tie everything together into an addictive package. By simply swiping a path from the plane, you can quickly redirect a plane. You may choose a longer or shorter path depending on the desired timing, and planes can be redirected at a moments notice. While we’re big fans of the game, we should be clear that this is a rather simple package with a single map, 4 types of aircraft and a single goal. Still, as always, gameplay is king and we feel it’s easily worth its $0.99 introductory price. Those looking for a more in-depth Air Traffic Control experience could consider the other two options in the App Store: iATC [$1.99] and ATC 4.0 [$2.99] — as they try to offer more depth but with arguably less of a “fun" experience.